Sebastopol Machinery Service at Millicent in south east South Australia has sold Australia’s first newly configured Flexi-Coil ST820 hydraulic tyne to local farmer Richard Kirkland. Now featuring a hydraulic tyne, the ST820 has been developed specifically to meet the needs of farmers who demand a cultivator with hydraulic break out and the capability to perform in a range of conditions. This new feature further enhances the flexibility of the ST820, which has been hailed as the ideal precision tillage tool for a variety of conditions. With its flexible frame and floating hitch the ST820 has been designed to closely follow the contours of the land, while reducing stress on components and providing a long, trouble free life. Along with sowing his own wheat, broad bean, hay and oat crops, Richard also does contract seeding work for farmers within a 50 kilometre radius of his 1,600-hectacre property at Furner, in south east South Australia. “I’ve known farmers who were using a spring type seeder and they might go through 10 points in a 30 hectare paddock because they hit tough patches the tyne can’t handle ,” Richard said. “In comparison, using the ST820 with its hydraulic tyne, I’ll be able to seed 1,600 hectares a year and might only go through one or two points no matter what the soil conditions are. When you consider that each point costs around $50 a pop, the hydraulic tyne delivers significant cost savings,” Richard said. Tyne durability and consistent seeding depth are delivered with enhanced hydraulic control. The softer return stroke gives the tyne a longer life, even when working in tough conditions. Plus, when compared to the speed of spring action, the hydraulic control is durable and ensures consistent sowing depth. The hydraulic tyne, in conjunction with the accumulator, cushions the return tyne stroke, and is best suited to seeding where trips are working day-in and day-out. It features a nitrided steel rod which resists corrosion - a common problem associated with liquid fertiliser use and exposure to the elements. “Some of our competitors use chrome; which is a more porous material and hence has a shorter lifespan. Our studies have shown that the use of nitride steel rods improves corrosion resistance by up to 50 per cent, along with offering improved impact resistance,” Steve Mulder, Flexi-Coil Sales and Marketing Manager said. Durability is also delivered as the cylinder has a short stroke which displaces a low volume of oil, generating less heat. “The end result is greater reliability and durability of components,” Steve added. The ST820 is available in three or five-section models with 183mm, 229mm or 305mm row spacing. The three-section model ranges in width configurations from 7.6m – 13.4m. Depending on the working width configuration, the ST820 3 section model ranges in transport width from 5.7m – 6.6m and ranges in transport height from 3.8m – 5.2m. The five-section model ranges in width configurations from 13.1m – 18.9m. Depending on the width configuration, the ST820 ranges in transport width from 5.7m – 6.6m and ranges in transport height from 4.2m – 5.1m. Flexi-Coil is a brand of CNH, a world leader in agricultural and construction equipment. 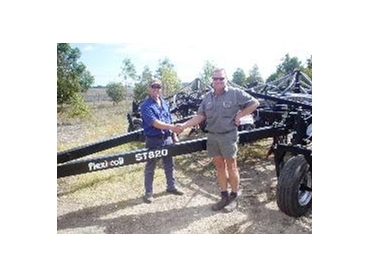 Flexi-Coil sells and services an innovative and diverse line of agricultural tillage and seeding equipment.